As promised from my first visit, I did return to the Blu Pizza e Cucina restaurant in Mary Brickell Village and this time we sat indoors and tried the famous pizza. My friend Lisa had just returned with her husband from Italy where she introduced me (years ago) to the most seductive, delicious pizza in the world in Sorrento, Italy. When she called me and told me about her recent trip she mentioned she was on a mission to find "the best pizza in Miami". Then I remembered about our pending return to Blu Pizza. Let the mission begin! It's Saturday night and we arrived just before 8pm. Once the special group of 20 people departed, the crowd was thinning and it lacked energy. The decor was earthy contemporary. The dining room was much smaller than we anticipated, a long narrow room as pictured above and below. THE SERVICE: while we were seated right away given the slow night, oddly, once again it took some time before a waitstaff person shared the specials and asked for our drink order. This happened at our first visit back in December (click here to read the review) except that night was peak season in December. I wonder why the delay this visit? After we placed our order, the service picked up and Lisa and I were satisfied. 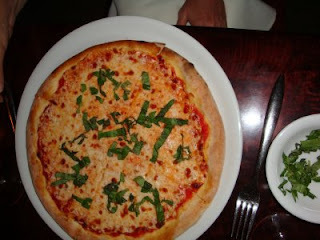 THE FOOD: Lisa, in fulfilling her mission, selected a plain cheese pizza with green leafy topping, the Burrata Pizza (tomatoe sauce, burrata cheese and basil). Hungry, I desired protein, I needed protein and chose a chicken dish "Blu Pollo". However, remembering the sensational pumpkin ravioli from our last visit, we decided to order a plate to share as an appetizer. The pumpkin ravioli with bits of asparagus and pink vodka sauce was again--perfect. Al dente, with a subtle sweet burst of flavor with every bite. Price- $15.00. If you enjoy pasta and do not mind a mild sweet flavor versus a tangy tomato sauce, you must try this dish! Lisa gave high marks for this pizza. In fairness to the restaurant, she set aside the high standards of the pizza in Sorrento, Italy. Later in the evening, Mr. Luca Delogu, (who I later learned was the owner and well known restaurant manager) visited our table and shared with us the pizza was a Roman style pizza, utilizing different ingredients compared to other regions of Italy. In my research I learned Mr. Delogu is a native of Rome. 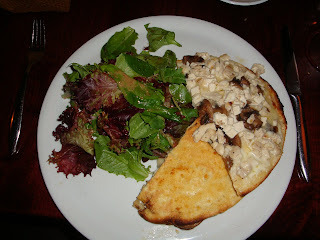 The description of my order read: Chicken breast, sautéed mushrooms, mozzarella, Brie cheese, and white truffle olive oil. Frankly, I was expecting a solid piece of chicken breast, not diced chicken. This was disappointing for the obvious reason that I was expecting more food (or chicken in this case). More importantly, given my special diet for medical reasons, I needed more protein. Thankfully I did not order wine that evening so I was safe. Aside from that, my dish was memorable. After my first bite, clearly this recipe would not work with a solid piece of chicken. The tapestry of melted cheese and bits of chicken interlaced with sauteed mushrooms and crowned with white truffle olive oil on a bed of crispy, cheese crusted panini exceeded my overall expectations. It was divine. I am officially inlove with truffle oil. More restaurants are cooking with this specialty oil to round out the combination of flavors. My dish was also accompanied by a green, leafy salad with an oil vinaigrette. An appropriate light accoutrement for a filling starch and protein dish. Throughout the dinner, more guests arrived. 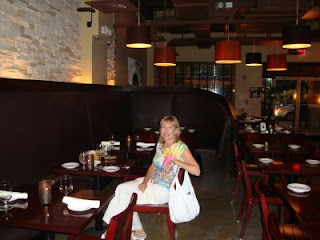 This uplifted the ambience and the manager commented that in the Brickell area, guests tend to dine later. As a resident of Brickell neighborhood myself, he was right. THE PRICES: The prices are fair given the culinary, varied menu, service and location . Lisa's pizza was $13.00 and could easily feed two people. Will I return? Absolutely. 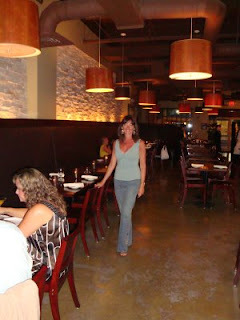 I recommend the outdoor patio although the humidity was clingy that night and indoor seating was the smart choice. After the rains, it cools off and outdoor dining is a must. If you're a late night eater, then indoor it is. Parking: There is a parking garage on 10th street with reasonable prices and an elevator which opens in the same covered building. So in the event it rains, you're always protected. The cost to park is only $4.00 for under 2 hours. The first 30 minutes is FREE. A great way to try their pizza is on Tuesdays. 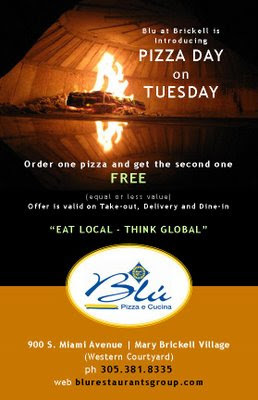 Right now Blu is offering a special of buy one pizza and get the second free of equal or lesser value. This is for dine in or take out. See the flyer below. Have you dined at Blu Pizza e Cucina? If so, share your comments below!